The metropolis of Belo Horizonte, Brazil is playing host to this week’s men’s club world championships. 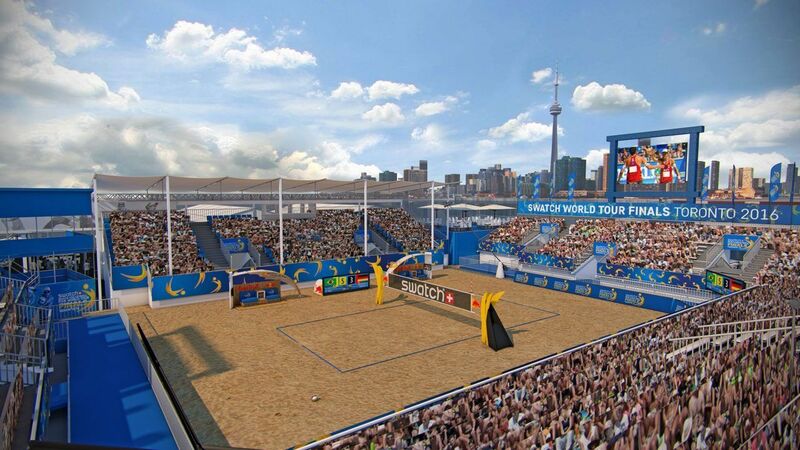 With the world watching, Toronto is the site for the 2016 Swatch Beach Volleyball FIVB World Tour Finals. Coming off of their Olympic Gold Medal run in their homeland Brazil, the #1 seeded team of Bruno Schmidt and Alison Cerutti look to retain their gold as they won last year’s World Tour Finals in Fort Lauderdale. Pool A also sees the Mexican duo of Lombardo Ontiveros and Juan Virgen. 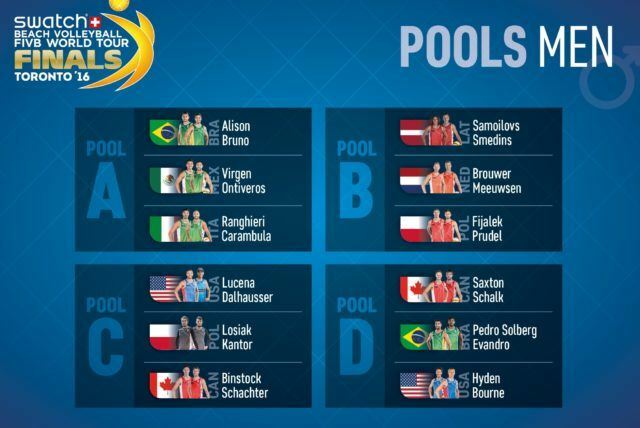 The last team in Pool A are the #9 seeds Alex Ranghieri and Adrian Carambula of Italy. Both Italian and Mexican teams in Pool A were knocked out of the round of 16 in the Olympics. Look for reigning Gold Medalists Bruno and Alison to win the group. The #1 seeds have 10 FIVB first place finishes. Coming off their Olympic Gold Medal will boost their confidence to end 2016 in a winning way. Pool B features the #2 Latvian’s Aleksandrs Samoilovs and Janis Smedins. The pair possibly had the unluckiest pool for Qualifications of the Olympics that saw them miss out on advancing to a qualification tournament by a mere set point ratio of .011. The favorites will come into the tournament with a lot to prove when they face off against #7 Alexander Brouwer and Robert Meeuwsen from Netherlands as well as #10 Mariusz Prudel and Grzegorz Fijalek who hail from Poland. 2008 Olympic Gold Medalist Phil Dalhausser and teammate Nick Lucena, who recently won the AVP Chicago Championships, are the #3 seed and favorite of Pool C. The USA representatives will face off against the young Polish side of Piotr Kantor and Bartosz Losiak as well as the team of Josh Binstock and Sam Schachter from host country Canada. Lucena and Dalhausser won the opening tournament of the Swatch Major Series in June at the smart Major Hamburg. Rounding off the men’s groups are Canada’s own Chaim Schalk and Ben Saxton who are the tournaments #4 seed. At #5 are Brazil’s Pedro Solberg and Evandro. Lastly in Pool D are Americans John Hyden and Tri Bourne. The favorite to win the tournament are Brazil’s Bruno and Alison. We could see a similar route here as they did to Olympic Gold as they defeated both Dalhausser and Lucena as well as Brouwer and Meeuwsen to reach Gold. They may have to repeat history to become 2x champs. On the women’s side, there are many storylines going into the tournament. With teammates splitting and going head to head with each other in a play in game and the recently crowned Olympic Gold Medalists being the #2 seed, Toronto will see some intense action. Pool A is host to the #1 seed Kerri Walsh Jennings and April Ross. Kerri is coming off of her first Olympic “failure” as she did not receive Gold, settling for Bronze in Rio. With Ross coming off of an AVP Chicago victory with partner Lane Carico and Kerri looking to revenge her Rio disappointment, the duo are undoubtedly the favorites for Pool A. Joining Walsh Jennings and Ross in Pool A are #8 Isabelle Forrer and Anouk Verge-Depre of Switzerland and the #9 Australians Taliqua Clancy and Louise Bawden. 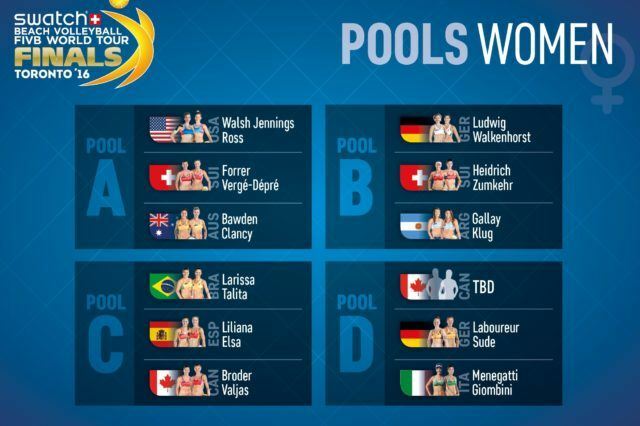 In Pool B, Olympic Gold Medalists Laura Ludwig and Kira Walkenhorst lead the way with the #2 seed. The German’s have already won two Major Series events this year. In their home country of Germany back in June and the most recent tournament in July in Austria. The favorites of Pool B will be facing off against #7 Nadine Zumkehr and Joana Heidrich of Switzerland and #10 Ana Gallay and Georgina Klug of Argentina. The #3 seed in Pool C is held by 4x Major Series Event Champions from Brazil Larissa Franca Maestrini and Talita Da Rocha Antunes. The duo finished their Olympic campaign in 4th place after falling to Walsh Jennings and Ross in the Bronze Medal match. Joining the two will be #6 Liliana Fernandez Steiner and Elsa Baquerizo McMillan of Spain as well as #11 Jamie Lynn Broder and Kristina Valjas of Canada. Pool D is host to the #4 seed. What is still undecided is who will be #4. After failing to win a championship as a team for 4 years, the Canadian team of Sarah Pavan and Heather Barnsley split after the Olympics and now have to earn their way into the tournament in a play in match on Tuesday. The compelling aspect is that their first match split apart will be against each other vying for the coveted #4 seed in their host nation of Canada. Pavan is now paired with Melissa Humana-Paredes and Barnsley now calls Brandie Wilkerson her partner. Following the play in match, the winner will face the likes of #5 Germany’s Julia Sude and Chantal Laboureur and #12 Laura Giombini and Marta Menegatti of Italy. There may not be a clear favorite for the women’s tournament, but expect Walsh Jennings and Ross or Ludwig and Walkenhorst to win. The two teams are likely to face each other for the Gold. The action starts Tuesday and runs through the weekend with the Women’s Medal matches on Saturday and the Men’s Medal matches on Sunday. Which NBA Stars Could Be Volleyball Giants?